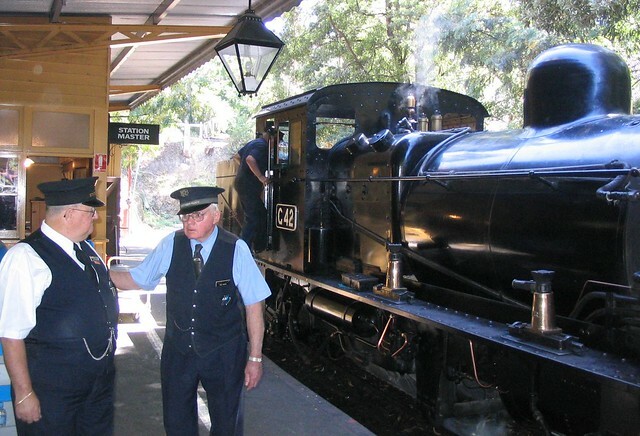 Prior to the 1990s, suburban trains had two staff members: a driver and a guard. The purpose of the driver is obvious. The guard… less so. The primary role of the guard was similar to those still used on trains in Brisbane and Sydney: verify the train was safe to depart, and in the case of trains with power doors, to unlock and lock them as appropriate, and to watch from their door at the back of the train while departing each station. They probably had other roles as well which are not apparent to us mere passengers. At some stage in the late-80s or early-90s, wheelchair ramps became common, and the guards also operated these. They were heavy metal ramps, kept chained to station poles and fences, and the guard would unchain and deploy the ramp as needed, with wheelchair users riding in the last door of the last carriage. In the early-90s, the government (Labor under Kirner, I think) tried to expand the guards’ roles. In the Comeng trains, they had doors to the cabs installed (removing the middle seats along the very back row of the passenger compartments) and had the guards rove through the train, in theory to provide a visible staff presence within the carriages. The problem with this was that guards still had to operate the doors at stations from within the cabs. This appeared to lead to a directive that guards should only rove if there was more than two minutes between stations, and they were unable to do so if the train was crowded, and even if lightly loaded they ended up scurrying through the carriages without stopping. At this time I regularly travelled between Hampton and Elsternwick for work. The guards were only ever seen roving, walking through, between Hampton and Brighton Beach. I never saw them anywhere else. Presumably they showed up on other lines. In October 1992 Jeff Kennett came to power, and amongst many reforms (arguably both good and bad) were sweeping cuts to public transport staffing levels. Metcard replaced many station staff, and also of course replaced tram conductors (though not before a chaotic period of long delays on trams when drivers sold and checked tickets). In 1994-95, train guards were removed, replaced by “Driver Only Operation”: changes to the trains to let the drivers unlock and lock the doors, mirrors and CCTV on stations to let them see the length of the train. Later upgrades included warning lights to tell the driver if any doors haven’t closed. Drivers are also responsible for deploying ramps (now lightweight, and stored inside the trains) for wheelchairs. Do we need them back? Was the removal of guards a bad thing? On reflection, I would say no. There have been some incidents (though as far as I recall, no injuries or deaths), particularly with prams and small children, at risk from doors closing too quickly, particularly when not boarding (as recommended) near the front of the train. There was a death in 2009, when someone tried to force open a door after a train started moving out of Melbourne Central Station — the man got the door open and jumped from the moving train, only to be caught as the door closed again. It’s unclear if the presence of a guard would have helped in this situation. Should the PT network have a greater staff presence overall? Yep. But I think overall, guards were of limited use on suburban trains. The removal of guards meant that the cost of adding additional train services fell markedly, particularly on weekends when penalty rates apply. Sunday services have seen the biggest improvement: prior to 1996 all lines ran only every 40 minutes. In February 1996 the busiest lines, through Caulfield and Camberwell, were upgraded to every 30 minutes until about 7pm*, followed by the Glen Waverley line the following year. In mid-1999 all lines went to every 20 minutes between about 11am and 7pm (matching Saturday frequencies). In 2012 the Ringwood, Dandenong and Frankston lines went to every 10 minutes between about 10am and 7pm (on both Saturdays and Sundays). *This is why on Sunday mornings, some lines start off at every 30 minutes, but those that missed-out back in 1996 still run every 40. Would these service upgrades have happened if we still had guards? It’s unclear. But I think there is a strong argument to be made that guards were of little use to passengers — employing more drivers to cut waiting times and crowding by providing more train services makes a bigger difference. So if you’re going to put more money and staff into the train system, drivers and maintenance staff are far more useful to most passengers than guards. And if some stations still have safety issues with boarding and departure, more CCTV and mirrors should be installed… perhaps alongside station/platform staff with dispatch paddles to assist. Some argue that both tram conductors and suburban train guards should return — for instance Family First called for this in both the 2006 and 2010 elections. I can see the benefit of tram conductors, and of more staff on stations, and of more roving security patrols, but I struggle to see why train guards, at least as they were once used in Melbourne, should come back. ← Previous Previous post: 10 minute trains are great, but why is the promotion of them so incredibly vague and uninformative? Very thoughtful piece, today, thanks. I recall the cover of a Melbourne telephone directory (remember them?) in the late 1980s/early 1990s showing the Restaurant tram from behind, with a “conductor” sitting in the rear driver’s cabin waving at the camera. The irony was that he was not needed to patrol the tram or collect tickets as it was a pre-paid restaurant tram. The only reason he was there was union rules at the time stipulated that every tram had to have a conductor and the union refused to make an exemption for this tram. A few years later conductors disappeared altogether. 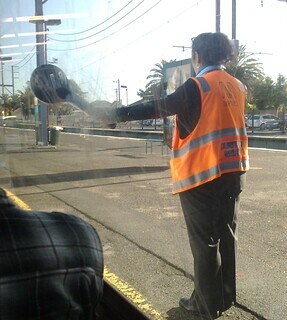 Forgive me if I have missed something, but is there a proposal to bring back train guards in Melbourne? @Gavin, nothing specific recently, but as noted in the post, it pops up from time to time as an idea. Mostly this post was motivated by wanting to get some history documented (shame I have no relevant pictures). As a Brisbane resident, what’s your view on the usefulness of guards in Brisbane? ^Without a doubt, I want to see them go, and the savings used to fund a 15 min frequency off peak timetable. In Sydney, there is a greater prevalence of curved platforms. Even where the lines are straight, there are more Sydney stations with bulbous island platforms than side platforms. Visibility for the driver would be perhaps a more significant issue than at most places in Melbourne. Just moving the guards from the middle of the train, to the back of the train, has caused issues. I’ve also been told that people have to become guards before they become drivers, I don’t know if this is always the case. It would certainly save a lot of money to get rid of them, though. The end of 40 minute services on Sundays is slightly more complicated. At some point the Sunday evening services on the Bayside Trains lines went to 30 minute services (except the Sandringham line which got 20 minute services). On 22/4/2012, when the 10 minute weekend frequencies came in, the 40 minute services on the Hilside Trains were replaced by a 30 minute service (except Eltham Hurstbridge which got a cut to 60 minute services). The remaining 40 minute Sunday morning services on the Bayside Trains lines ( the Northern Group and maybe he Sandringham line) have not been upgraded. I think metro trains Melbourne should have guards on their trains because if there is an argument or a fight the guard can sort it out. I also think metro should have curved platforms because it is easier for a driver to give him or herself the all clear to leave. @Nicholas, wow, did you even read the post? How would a guard in the back cabin sort out a fight in one of the carriages? @Nicholas, that is what CCTV helps with. Driver can call police, arrange PSO’s or AO’s to assist. They are trained to deal with this. Guards afaik were not. And Daniel is right. There is no way a guard can sort out a fight in another carriage. And ESPECIALLY not on his own.